Newt Gingrich described the President of the United States as 'the most powerful man in the world'. If that is the case, then the values and trustworthiness of the incumbent is of interest to all the world; and if a person seeks that universal power, then he or she is answerable to all the people of Earth, not just the USAmericans who have the choice of voting. 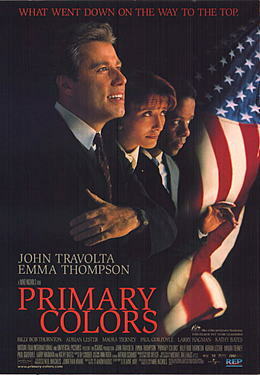 Primary Colors is based on a novel that itself raised many questions. Originally the novelist hid behind anonyminty, but he later did come forward (he is not credited). The novel and film are inspired by Clinton. Henry Burton (Adrian Lester) is our representative in this film, the person with a conscience who is confronted by the pragmatically selfish, arrogant, and rampantly illegal and immoral behaviour of those who set themselves up as the leaders and moral protectors of contemporary humanity. Richard Jemmons (Billy Bob Thorton), Daisy Green (Maura Tierney) and Libby Holden (Kathy Bates)run a campaign where the candidate (John Travolta) is his own worst enemy. One wonders how much of the 'inside story' the writer was privy to informs this film. It certainly seems all-too-familiar, and yet despite this vision, popular as it is, hasn't caused the populace to rise up and demand higher standards from the self-called higher-ups. The film isn't without its amusing moments, especially the challenging physical comedy of Travolta and Emma Thompson as the president's wife dancing 'between the beats' to portray bad dancers. In a similar vein, Wag the Dog side-steps the presidential misconduct and concentrates on the cover-up. It treats the cover-up as something divorced from the president. Primary Colors (Colours) shows the president up close and personal, and consequently holds the man and his actions up to scrutiny.